When is a spork not a spork? When it is a titanium super spork. As you can see, the spork still has the required spoon and fork combination; however, this version puts them on opposite ends instead of the usual hybrid. The titanium part also puts this well above the norm. You might also notice that one side of the fork has been sharpened into a knife. This sounds like the perfect jobsite tool for your lunchbox, but I am sure its titanium strengths can also be put to other uses. Mini prybar? 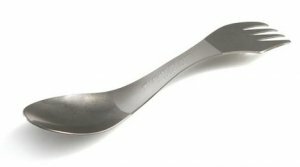 The spork is only 17cm(6.69") in length, weighs only 17g(.6oz) and costs around $13.